If you've ever perused the listings on AirBnB you've likely found there are way too many cute houses around, and the thirst to go live in them is all too real. Lauren and I made the mistake a few weeks ago of taking a look at the listings around the Bonavista area - this was a very good mistake. Once we found the adorable listing for this rental home in Newmans Cove, and the available weekend, serendipitously falling on Lauren's birthday weekend, we had to go! After the ~5 hour drive from St.John's, including food stops of course, we arrived late in the evening to our cozy home for the weekend. First thing's first, we set ourselves up with a couple glasses of wine and a charcuterie plate to relax ourselves for our busy day to follow. We awoke full of excitement to start our weekend getaway and began prepping a brunch of toutons and mimosas. You may remember seeing our post on the cute brunch tees we wore from Ethereal Boutique just for the occasion! We then set out to visit Trinity for the morning. Only a short drive from Newmans Cove, Trinity is an adorable town with lots of heritage and history worth exploring. Plus, it has amazing whale watching - you can read more details about that in our Whale Watching post! and devouring the delicious fish and chips served right on the dock! Before we bid farewell to Trinity, we made a stop into Aunt Sarah's Chocolate Shop and stocked up on goodies to treat ourselves to over the weekend. My favourite was the Cheescake Truffle Chocolates! Next we took a drive through Port Rexton. This has become a very popular destination since the opening of the Port Rexton Brewery, not to mention the town is pretty sweet! We made a stop at the Two Whales Coffee Shop for a couple Americanos and took a jaunt around town. Lucky for us, we found the perfect lookout with brightly coloured benches that made for the perfect perch to drink our coffees. Finally, to end our Saturday excursion we set back to our home in Newmans Cove. On our drive we stumbled upon a few installation art exhibits for the ongoing Bonavista Biennale! Our favourite was the sitework by Pam Hall which featured cod figures made from flour bags floating and blowing in the wind at the waters edge. It was truly a beautiful and calming sight! Our night was capped off with more laughs and drinks along with a Seafood Risotto by Lauren and a birthday cake transported all the way from Rocket Bakery! If you haven't tried their Vegan Chocolate Cake, I urge you to do so! Vegan or not, this is hands down the best chocolate cake you will ever have - it's my choice for every celebration (and I'm not vegan)! Our final day started with lazing around our AirBnB and saying goodbye to the cute house. Once we were all packed, we headed out for another adventure - to spend the day in Bonavista! 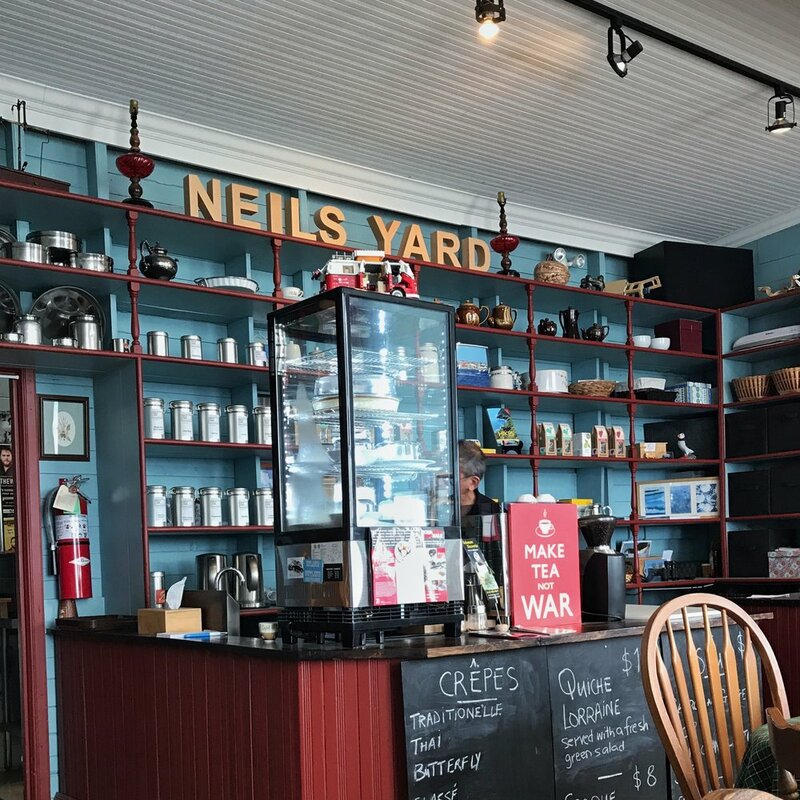 The visit to Bonavista began with a stop at Neil's Yard, a creperie perched just off a dock with an incredible view of the water. If there's a good place to start your day, this is it! We chose the Dark & Rich crepe, because I mean, what else are you looking for? It was phenomenal! At this point, we were ready for second breakfast, so we headed straight for the popular Boreal Diner. I had been anticipating a visit to this spot for quite some time and was so pleased to finally have made it! The interior of the building is beautiful, minimal, and maintained an airy brightness while being cozy at the same time. Although the breakfast didn't blow me away as I had hoped, I wouldn't miss the opportunity to visit again and try more of the menu. Now that we were sufficiently stuffed, we took a drive to Cape Bonavista to see the lighthouse and the super cute puffins. We sat for quite some time watching the puffins land and take off around the cape, they really are the cutest things! Not to mention, the surrounding view is stunning! Just be prepared, it's windy! The final stop on our weekend adventure was a drive to the Dungeon Provincial Park. On your way there you drive through open fields which has roaming cows and horses alongside the water. I desperately wanted to touch a horse, Lauren stopped the car and totally called my bluff on that one though. It didn't happen; maybe next time. Once you arrive into the Dungeon area you'll find a massive sea cave and archway - it's so cool to see! Okay, that was a fib - we did make one more stop. Before we started on our journey home we made a final stop into Sweet Rock Ice Cream to try out their homemade ice creams. Then, we set back on the highway to reminisce on our weekend away.